A baby boy turned to flotsam. Washed up on the shore, face down in the mud. His family, refugees from Syria’s civil war, had tried to reach Greece, but their over-crowded raft overturned in the Mediterranean Sea and he drowned along with his brother and mother. The viral image of 3-year-old Aylan Kurdi’s lifeless little body on a Turkish beach has shaken the conscience of the West and wrenched America’s attention to the refugee crisis now rocking Europe. Newsflash to the oblivious citizenry of the power-projecting “free world”: this is what war looks like. This times ten million. That which is mere “foreign policy” to you and your government is desperation and death to those on the receiving end of it. Children just as innocent and precious as Aylan are being driven into the sea in Libya, incinerated by drone in Pakistan, or starved to death in Yemen all the time, and it is all on your dime. And every single instance creates a sight just as achingly forlorn and horrifically tragic as the one above, even if it isn’t photographed and seen by millions. 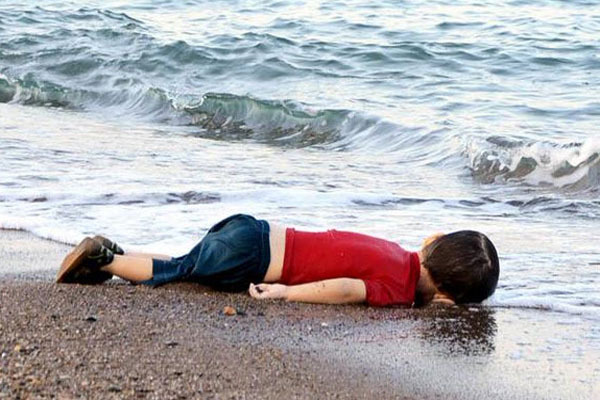 Aylan drowned in the arms of his father, who had been desperately trying to keep his head above water. The prelude to the disaster probably looked something like this photo of another Syrian refugee family. It actually shows an arrival and not a departure. Still, especially for anyone with young children, the picture is a punch in the gut. It only takes a shred of empathy to instantly imagine how the father must feel. Overwhelmed and near the end of his rope. His daughter’s arms wrapped around his neck. His son’s face buried in his chest. Both looking to him for protection and provision he ultimately might not be able to give. It is no wonder this visceral photograph has also gone viral. Another newsflash: this is what war displacement looks like, both in the sea and on dry land. What you see in his face is the anguish felt right this very moment by the many millions of mothers and fathers driven from their homes and sources of livelihood throughout the countries shattered by weapons from the West: Iraq, Syria, Libya, Afghanistan, Yemen, Somalia,Palestine, Ukraine, and more. It is a shame that the curiosity, empathy, and imagination of most are so stunted that they require such vivid imagery as this showing up in their news feeds to feel concern for the havoc wreaked by their governments’ policies. And then they are stirred, not enough to actually learn a damn thing about it, but only enough to be manipulated into demanding— or at least countenancing — more of the very same kind of intervention that caused the tragedies in the first place. Warmongers in government and the media are perversely but predictably trying to conscript Aylan’s corpse into their march to escalation. They are contending that Aylan died because the West has not intervened against Syria’s dictator Bashar al-Assad, and that it must do so now to spare other children the same fate. Um, no, Aylan’s family were Kurdish refugees from Kobani who had to flee that city when it was besieged, not by Assad, but by Assad’s enemy: ISIS. And ISIS is running rampant in that part of Syria only because the US-led West and its regional allies have given them cover by supporting and arming the jihadist-dominated uprising against Assad. The West has been intervening in Syria heavily since at least 2012. Indeed, it is Western intervention that has exacerbated and prolonged the conflict, which has now claimed a quarter of a million lives. But because much of the intervention has been covert and by proxy, it has received little media coverage and public attention. So the “blowback” that results from it, including Aylan’s death, can be conveniently blamed on alleged “non-intervention” and used to justify more overt and direct intervention. In this way, governments have long exploited public obliviousness and gullibility to get their wars. Moreover, if the hawks were to get their wish of seeing Assad finally overthrown and his forces dismantled, there would then be zero local resistance to ISIS, Syrian Al Qaeda, and the other jihadist groups completely overrunning Syria. As bad as the refugee crisis is now, just imagine what it will be like as all of Syria’s many religious minorities desperately flee from these hyper-violent and hyper-sectarian Sunnis, armed to the teeth with Western weapons. Far from preventing such tragedies as Aylan’s drowning, intervening further would only produce many more. You are troubled by that picture you saw on Facebook. Good. It means your heart hasn’t been completely hardened by nationalistic and xenophobic indoctrination. But don’t let it make you susceptible to war party manipulation. And don’t just “raise awareness” of it by liking and sharing the tragedy and then forgetting about it in a month. To truly contribute to justice for Aylan, work to set things right. And the first step to setting things right is understanding. Make it a project to learn about the role of foreign intervention in the Syrian Crisis that is creating so many of these refugees, and in the wars roiling the Middle East, North Africa, and South Asia in general. And once you’ve acquired understanding for yourself, work to spread it to others. Prince EXPOSES The Illuminati’s Chemtrail Program! Any way you slice it though, the poor little child is dead and it’s sad. Breaks my heart. That story was suspect from the start for the simple reason that refugees / migrants in Turkey are being fed and sheltered and are not in any immediate danger.